It is widely accepted that many jobs are stressful. Anyone working in fast-paced, high-pressure environments can attest to the wear and tear that they can experience over time when the demand outweighs their capacity to deliver, or when the work is dangerous or numbingly repetitive, when the hours are long, and the pay is low, or when they work in a service industry where dissatisfied customers use staff as a lightning rod for their frustration or even, at times, their rage. Ask any airline customer service agent what it is like to handle a horde of angry travellers when all flights have been delayed by an unexpected storm and this poor person’s power to solve the dilemma is limited, or even non-existent. Ask the factory worker operating a dangerous machine for 12 hours a day on a line with poor working conditions and a hostile climate. Ask the call centre operator (call centres have one of the highest turnover rate of any job at the current time) where you are underpaid, monitored for the length of your calls (“that was too long” “you said the wrong thing, take the next call, go go go!”), and sometimes they don’t even have the right to go to the bathroom during a shift without being penalized. The speech writers working to deadline, the day trader, the server in a diner who is on their feet for 12-hour shifts, air traffic controllers … the list is long, and most of us have worked in such settings at some point in our lives. The term organizational health refers to the varied and often complicated factors that affect the capacity and performance of an organization. Work hours, type of work, stress levels, budgets, workload, turnover and so many other factors all have an impact on the health of an organization. At the very core of this is the health of each individual including: how they feel about their jobs, how they perform them, how committed they are to their roles and how their jobs are affecting them personally. How Does Workplace Trauma Exposure Affect Organizational Health? Stress has an enormous impact on the health of an organization, and when the added element of secondary and/or direct trauma exposure is present, balancing workplace wellness becomes far more complicated, and we would argue, even more critical. High-stress, trauma-exposed work environments such as health care, law enforcement, mental health services, child welfare and many other related fields have unique and specialized organizational health needs. Why Don’t Employee Wellness Initiatives Always Work? Many human resource companies have become interested in staff wellness over the past two decades and have explored ways to reduce burnout, increase employee satisfaction and eliminate workplace grievances, disability claims and attrition. Some of those initiatives have been effective, but the generic “in-the-box” workplace wellness programs have not always been successful in the complex settings that we, at TEND, work in: hospitals, correctional facilities, child welfare, law enforcement, anti-human trafficking, refugee boards and similar challenging work environments. Over the years, we have been approached by leadership in these workplaces who are extremely concerned about the emotional and physical health of their staff and are witnessing high turnover rates, low morale, and difficulty attracting and retaining skilled labour. TEND’s Co-Executive Director, clinical psychologist and trauma specialist Dr. Patricia Fisher, became very interested in the truly unique characteristics of workplaces that have regular exposure to a combination of high stress, high volume of work, diminished resources and trauma. Dr. Fisher has spent the past two decades developing a framework to understand these workplaces which she refers to as “high-stress, trauma-exposed” work settings. Dr. Fisher developed the Organizational Health Model for Complex Stress environments that can assist leadership in developing a better understanding of best practices and effective interventions to support their teams. Dr. Fisher’s model has demonstrated that we need to start with the foundation elements which are Leadership, Succession Planning and Health and Wellness. Leadership: Leaders are people too, and they are powerful role models for their staff. Leaders are also often working under extremely high stress burdens themselves. We also need to remember that leaders are often promoted into their roles with very little training or experience managing other people, and we need to give them the time, support and training to get competent in their new role. Succession planning refers to several factors: addressing the inevitable loss of staff through retirement (a very large demographic shift that we are in the midst of, with many Baby Boomers retiring), illness and job change, and the critical need to attract and retain new hires such as Millennials who often have different priorities and values in terms of work-life balance. As the proportion of new workers in teams increases, we often find that the more experienced staff are depleted and have sometimes become disillusioned and are, as a result, unable to perform the crucial role of supporting and guiding their more junior team members. Health and wellness is also an essential element. New research on the impact of toxic stress has clarified how trauma-exposed work creates a unique climate with increased risk for serious stress and burnout effects for individuals, leaders and teams. These can inevitably lead to a rise in sick time, low morale, lack of team cohesion and high turnover. These consequences can, in turn, seriously limit a team’s ability to work effectively and efficiently. The good news is that there are some excellent resources to help high-stress, trauma-exposed organizations assess their functional capacity and decide where to begin in implementing effective strategies to support their teams. Dr. Ginny Sprang, from the University of Kentucky and some of her colleagues (Sprang et al, 2014) developed a free Organizational assessment tool: the Secondary Traumatic Stress Informed Organization Assessment Tool (STSI-OA). The STSI-OA is an assessment instrument that can be used by any organizational member at any level to evaluate the degree to which their organization is STS-informed, and able to respond to the impact of secondary traumatic stress in the workplace. This intensive online course was designed by Dr. Patricia Fisher for managers and supervisors of teams working in high stress, trauma-exposed environments. The course supports participants to be effective leaders and to build strong, resilient and productive teams by exploring their vital role in Organizational Health and recognizing the impact of chronic stress on individuals, teams and organizations. Dr. Fisher also developed the Organizational Health Roadmap to meet the needs of the thousands of individuals from so many trauma-exposed fields who have taken our Organizational Health and Leadership training and who asked for more resources to take them beyond the basics. 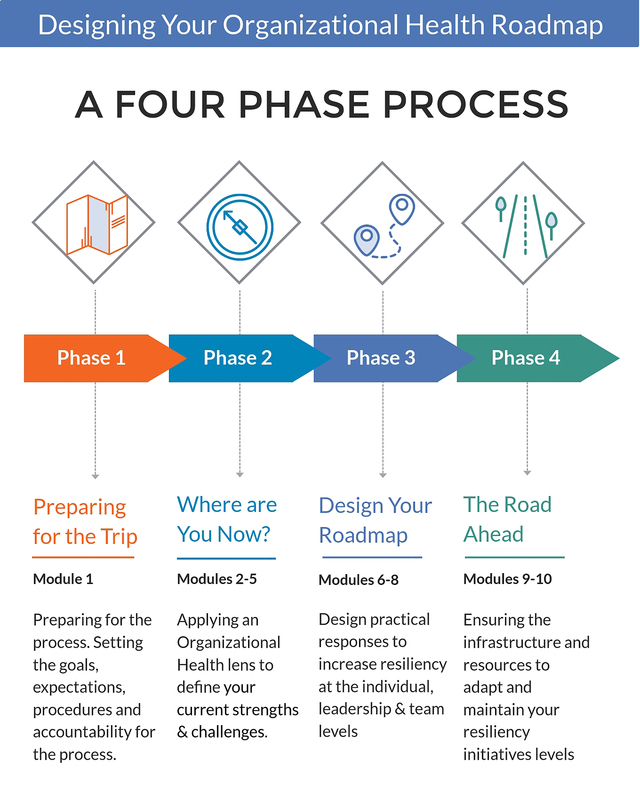 The Organizational Health Roadmap provides a guided 10-module program that supports your Implementation Team as you develop a practical and sustainable action plan to meet the specific need and circumstances of your team. While trauma-exposed organizations share a range of specific risks and resiliency factors, the Roadmap program recognizes that each workplace experiences a unique profile. You are the experts in your own workplaces – and the Roadmap is designed to guide you as you first evaluate your own unique resiliency and risk profile, and then build a custom set of practical solutions and implementation plans to fit your specific circumstances. Fisher, P. (2016) Building Resilient Teams: Facilitating Workplace Wellness & Organizational Health in Trauma-Exposed Environments. Kingston, TEND ACADEMY. Sprang, G., Ross, L., Blackshear, K., Miller, B. Vrabel, C., Ham, J., Henry, J. and Caringi, J. (2014). The Secondary Traumatic Stress Informed Organization Assessment (STSI-OA) tool, University of Kentucky Center on Trauma and Children, #14-STS001, Lexington, Kentucky.